Hugh Jackman is “all good” following his latest cancer scare, according to his rep.
Hugh Jackman is “all good” following his latest cancer scare, according to his rep. The 46-year-old actor was recently treated for basal cell carcinoma for the third time in the last year. 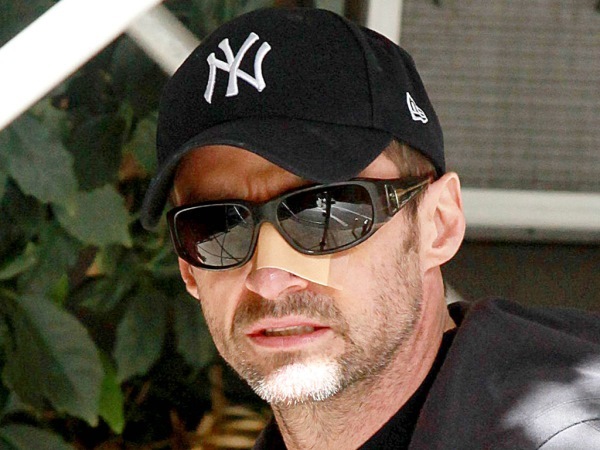 But a spokesperson for the star has assured fans there is nothing to worry about after Hugh was seen out and about with a bandage on his nose. “[He’s] all good [now],” his spokesperson told E! News. Hugh initially announced he'd been treated for basal cell carcinoma in November 2013, again on his nose. At the time he publicly thanked his wife Deborra-Lee Furness for making him get the suspiciously-shaped mark checked out. He had his second growth removed in May. "So just to be clear, it is skin cancer—it's a basal cell carcinoma, which of all the skin cancers, is the most minor,” he clarified in a statement to the outlet previously. "But you do need to take care of it immediately, because it's growing,” he added. The actor also took the opportunity to urge others to be vigilant about their health. "It doesn't matter who you are, get checkups,” he said, adding after his last treatment he expected another growth to form. "I'm realistic about the future and it's more than likely that I'll have at least one more but probably many more, which is not uncommon for an Aussie particularly from English stock growing up in Australia where I don't remember ever being told to put sunscreen on," he told the Associated Press. He is now making it his mission to warn other people about the threat of sun damage. "The beauty of this is it's all preventable, it's just about getting proper check-ups. I can be typical man, a little lazy, I couldn't be bothered and now I'm not lazy at all," he explained.